Thanks for the info, Manny! 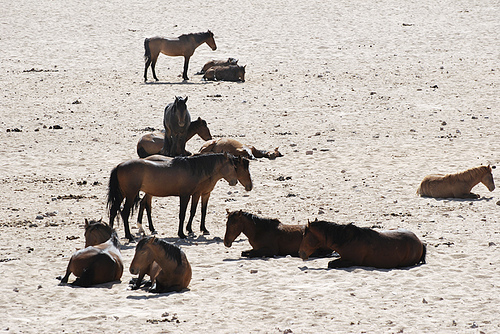 The feral horses in the Namibia desert go back to WWII. The Germans occupied the area for years, and at the end of the war, they packed up and left leaving the horses behind. What we see today are the descendents that have adapted to the extreme conditions. They have no predators, are very peaceful, and do approach man on occasion. These past few years, the pack has had some help from some people : a well has been built, and they get occasional hay.